James Earl Carter, Jr. was born on this day in Plains, Georgia, USA in 1924. He is 89 years old. He was the oldest of four children born to James Earl Carter, Sr and Bessie Lillian Gordyn Carter. He was the first future president to be born in a hospital. Jimmy was a good student and avid reader. After graduating Plains High School Carter attended Georgia Southwestern College and Georgia Tech before entering the United States Naval Academy. He graduated 59th out of 820 in 1946. He served for seven years in the Navy’s Atlantic and Pacific submarine fleet. After his father’s death he resigned his commission and returned to Georgia. In 1974 he ran for President of the United States against Gerald Ford. 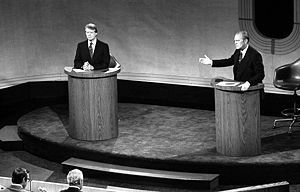 “Carter won by 297 electoral votes to 241 for Ford.” [Ibid] He was the 39th President. He entered the White House the country was in an economic crisis. One of his first acts at President was to sign the “Chrysler Corporation Loan Guarantee Act of 1979” which bailed out the car maker. He also worked to improve the environment. 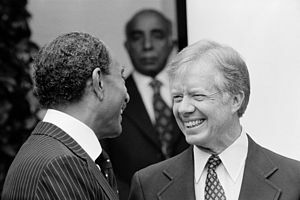 Held the Camp David Talks (which brought about the Camp David Agreement between Egypt and Israel in 1978. His bid for a second term was unsuccessful. Ronald Regan swept the election taking 489 electoral votes to Carters 49. Carter carried only six states. The day Regan took office Iran released the hostages. Carter returned to Georgia to find that his finances — which had been held in a blind trust while he was President — had been mismanaged by the trustees. He was over a million dollars in dept. 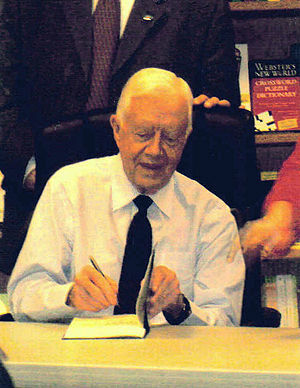 Despite that set back Carter established the Carter Center at Emory University, wrote books (he’s written 27 book so far), and worked to help Habitat for Humanity. He still lives in Plains, Georgia with his wife Rosalyn. Every year they volunteer for a week with Habitat for Humanity to build or restore homes for the needy. 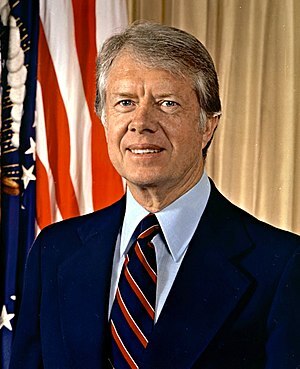 This entry was posted on Tuesday, October 1st, 2013 at 10:15 pm	and tagged with CarterCenter, Jimmy Carter and posted in Jimmy Carter, postaday, Thought of the Day, Today's Birthday, United States. You can follow any responses to this entry through the RSS 2.0 feed.